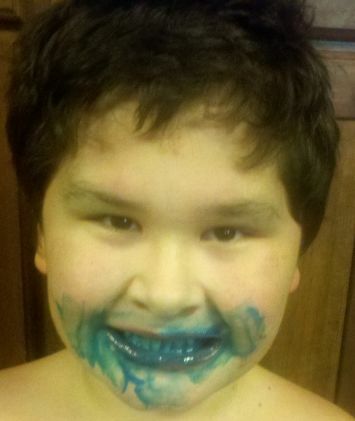 If your kids are anything like my kids, then you are constantly being pranked by them. My children are always pulling innocent little pranks on me like everyday is April Fool's Day. Last night, I got them! Revenge is sweet!! Sneak into the bathroom and put 1-2 drops of food coloring on their toothbrush bristles. 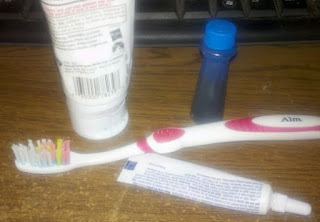 Then take the numbing stuff and put a small amount in between the bristles and then the toothpaste. Call them in to brush their teeth and then get ready to laugh! 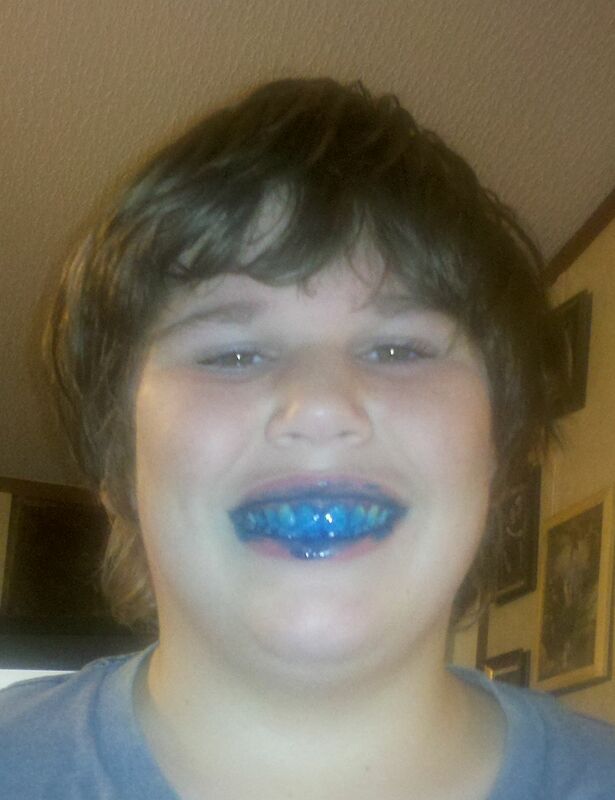 (Just do not do this right before school because if you use too much of the food coloring, it will take 2 more brushings to get all the color off. Here is how my 2 boys looked after the prank. They both were good sports and admitted I got them good. Have you ever pulled a great prank on your spouse or kids? I would love to hear about it. We do a lot of freezer cooking at our house and one thing we make EVERY week is Chocolate Chip Drop Biscuits. Our family loves them for breakfast and hope your family will too. In a large bowl, mix together the flour, sugar, baking powder, and the salt. Stir in the margarine. Mixture should be crumbly. Stir in the chocolate chips. Add the milk, a little at a time, just until the dough forms. Drop by spoonfuls on a cookie sheet. Bake at 425 degrees for 12 minutes. We eat these fresh from the oven and then we throw the rest into a baggie and freeze them for future breakfasts! Reheat 2 at a time in the microwave (about 25 seconds). Great for breakfast or a quick pick-me-up! Just wanted to share with you all the newest addition to our household. This here is "FredElmo". FredElmo "hugging" my son's arm. My 7 year old son named him, betcha couldn't have figured that out on your own. :-) We went to visit our daughter in Stillwater recently and on the way home we stopped at an animal shelter. I have been doing rescue for over 15 years and just felt compelled to stop at this one. My 7 year old and I went in and looked around and lo and behold this little guy was in a pen looking scared to death. The lady in charge said their shelter was not equipped for cats so they would have to put it down. She said it was a feral cat and I told her we lived over 2 hours away and had no way of transporting the kitten that far if it was wild. 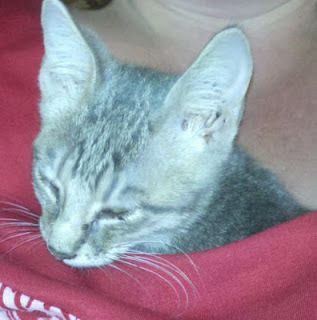 She gave us the kitten (for free) and gave us a carrier to take it home with. She was great! 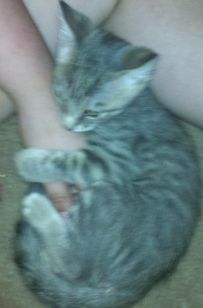 Needless to say, when we finally reached home and let it out, the kitten was not feral at all. The poor thing had just been scared to death because of all the dogs in the kennel. This is the most loving and gentle kitten and is now my 7 year old's first pet. Anytime I am at my desk, he crawls into my shirt, turns itself around and falls asleep. Thanks for letting us share with you all today. Furry hugs to each of you. 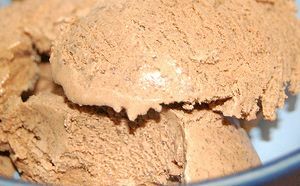 We recently made some homemade chocolate ice cream and many people asked for the recipe. This recipe is super simple and the ice cream comes out as a soft serve very similar to the Frosty's from Wendy's. I used all generic brands. Instead of whole chocolate milk, I used the 1% and it still turned out great. Pour 4 cups chocolate milk, the whipped topping and the sweetened condensed milk all together in a large pitcher or bowl. Stir well. 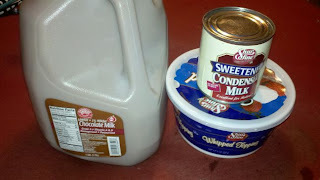 Once it is mixed well, pour it into your ice cream freezer. Pour in more chocolate milk until it reaches the "fill" line. Put the paddle in place and lid. Put machine together and add the ice and rock salt around it as your directions apply. This comes out so good. 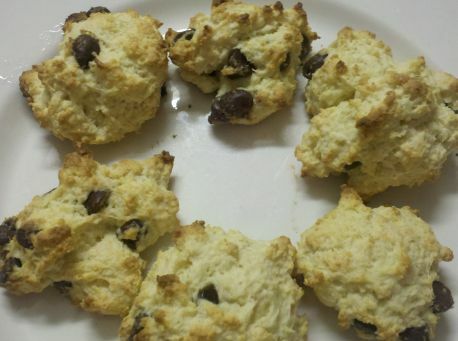 My family swears this is the best recipe ever and since it is so easy and only 3 ingredients is an added bonus. This ice cream would go wonderful with my Chocolate Cobbler or my Death by Chocolate Cake! I recently read another blog and the writer talked about frugal living and how their family of 6 lived off of $2200 a month. I did the figuring and seen they live off of an average of $367 a person. Heck, I can do one better. Our family of four lives off of $1300 a month, which is an average of $325 a person. Not trying to have a "I'm better" contest or nothing. I applaud them. It just made me realize how little we truly live off of ourselves. I know many people who make 3 or even 4 times as much as we do and they seem to struggle financially worse than we do. How do we do it? We scrimp and save and we make a serious effort to live off what we have. Am I being boastful? No, I am just sharing what we do in hopes of helping at least one other family get by on what they earn. I know many of you make a lot more and I am glad for you. Our family made a conscientious decision to live on a smaller income for many reasons. Each family must do what they think is right for them. We are judging no one and hope no one will judge us either. I know people who have a mortgage payment that is more than our take home income. Glad for you but am also glad it is you and not me. First of all, we drive a car that is 15 years old. It is paid for so we have no car payment. We do not see the need for a newer car when the car we have works just fine for us. This car has driven us from eastern Oklahoma to New Mexico two times and to Galveston, TX there and back. We have had the car for 2 years now and my hubby does all the maintenance on it himself. As far as insurance goes, we carry the state minimum. Secondly, we do not have television reception (no dish, cable, or nothing like that). We have a Blu-Ray player and that is what we use to watch movies. We have allotted $35 a month into the budget to purchase new movies (DVD/Blu-Ray) etc. so that is our entertainment allotment per month. Wal-mart has DVD's for $5 and Triple feature Blu-Rays for $13 so we can actually get a good deal of movies each month to add to our collection. Many people have suggested we use Hulu or Netflix but our internet is capped and we can not do this. Besides, our family likes to watch movies over and over again so owning the movies on disc works for us. Third, I know soda pop or coffee is a huge amount of money for some families each month. We rarely buy soda or coffee anywhere. If we want coffee, we make it at home. Soda pop, yes we occasionally stop at the store and buy a fountain drink but it is a treat and not an everyday occurrence. We may buy a total of 3 two-liter bottles of soda a month. The kids and I drink mostly water at home and hubby survives off of coffee. We purchase kool-aid or make iced tea or drink milk too. Eating out: We eat out usually just once-a-month and that is when we do our monthly grocery shopping. We usually stop at McDonald's and we all get a meal. It helps that we live in a small city that has no fast food restaurants in it but even if it did, we still would not eat out much. The $20 it could cost to feed our family of 4 at a fast food restaurant could be better spent by buying $20 worth of groceries. The key is asking yourself: Okay, I can spend $5 getting us all a fountain drink or I could spend the $5 buying a 2 liter bottle of soda, a loaf of bread, and a pkg. of hot dogs and have a little left over. Which is smarter? Same with a meal out. $20 can buy a LOT of groceries and feed your family for several meals. I have received many rude comments about McDonald's should not be considered eating out. It is eating a way from home so it is eating out. Please be nicer. I have also signed up for Mypoints.com and regularly order free samples online. I have heard all the excuses as to why others do not do this but it really helps out. By only clicking on emails (never made a purchase yet), I average $100 in Walmart gift certificates a year from MyPoints. I get free samples in the mail at least 4 times a week by only requesting them. Some samples are for full size products. In fact, I just got a free coupon in the mail for $9.00 worth of bacon or lunch meat. It IS worth your time to do these things. If you smoke, quit smoking or buy loose tobacco and roll your own. You can save yourself and your family a LOT of money. My hubby used to smoke over a package of cigarettes a day but once we had to cut back, he took up smoking a pipe and we buy his bag of pipe tobacco for $15 and the bag lasts him a full month. That switch saved our family a LOT of money. (Yes, I know smoking is bad for him. Yes, I prefer he would quit but it is his only vice and I love him). Household needs: One of my weaknesses is my shampoo. I love Pantene shampoo and that is one area that I splurge but I do buy the $1 conditioners. Walmart always has White Rain brand or another good brand on sale for $1 or less. When I buy household items, I buy what we need for one month so I do not have to run to a convenience store or another store and buy items for more than I prefer. If I see toothpaste on sale for a good price, I buy 10 of them to last quite awhile. We never buy paper towels or napkins. We use washable hand towels instead. Same goes with paper plates and disposable cups. No need for them, we use the ones in our cabinets instead. We make our own air freshener. 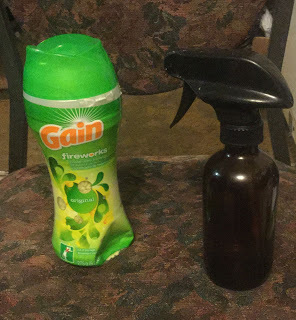 Homemade Air Freshener, similar to Febreze. We make our own dishwasher detergent, our own detergent for washing clothes, and our own fabric softener liquid. I clean with bleach or vinegar. There are ways you can cut out a huge chunk of your monthly bill here if you try. We currently spend $50 a month on household items (toilet paper, etc.) and usually have money left over because we do not use that much. Utilities: We have a well and do not pay a water bill. Our home is total electric so there is no gas or propane bill. We try to keep the electricity bill down as much as possible but the bill gets to be close to $250 in the summer and about $150 other times of the year. We turn off lights when we leave a room, etc. We cook in a crock pot at least one meal a day so that cuts down on heating the house and on running a stove or oven. I try to cut out process foods and "easy" foods so we do not use the microwave as often as many families. Also, we do our laundry by hand outside and let them "line dry". This saves on water and electricity. When it comes to using the dishwasher, I ask myself "is this dish really that dirty?" If the answer is no, it is easy to just hand wash it and put it away. No need to run every little dish through the dishwasher and use all that water and electricity if you don't need to. We could save more money on the electric bill by turning up the thermostat in the summer time and down in the winter but I suffer from MS (Multiple Sclerosis) and can't stand the heat. It makes my symptoms worse so this is one area we do not skimp on. Groceries: We spend about $400 a month on groceries every month. We eat breakfast (usually pancakes, breakfast burritos, cereal, etc. ), then for lunch is usually a sandwich or soup and supper is a cooked meal. We do not buy many "snack" foods or heavily processed foods. If we snack, it is on popcorn or homemade desserts. Instead of hamburger Helper, we buy rice, pasta, etc. and make our own. We have chickens for fresh eggs and grow food in the garden. We can our own salsa, jams, etc. I make my own chicken broth and chicken stock. I buy whole chickens and use pretty much EVERYTHING! I buy generic food items mostly. Little cuts here and there really add up and we never go hungry. In fact, we help out friends by sharing our groceries and still have enough for ourselves. Also, we shop just once a month. This planning saves us a lot of money because rarely does one run to the grocery store and only buy just what they need. Every time you go, you spend more than you expect to. By going only once a month, we avoid these extra expenditures. Gas: Don't run to the store every time you think you need something. Learn to slow down and think if you really need to run into town or whatever. We rarely run into town for one thing. If we run to town, we make it worth the trip. We pick up the mail, visit family of friends, go to the library, etc. all at once to save gas and time. Is it necessary to go to the post office everyday or can you get by with going just once or twice a week? Plan your trips and save that fuel. For the people who are bashing my post right now, for so many petty reasons, I am just trying to help others. Sorry my grammar and "writing tone" is not perfect. I am a hick. Hence the name of the blog. 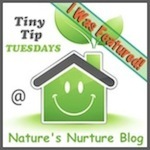 Why you would come to my blog expecting anything other than country wisdom is beyond me. Regardless, I forgive you. :-) Anyway, people have also commented on us using more water by washing outside. No, that is not true. We have figured how many gallons of water to wash outside compared to using a washer and we use less and the sun dries our clothes. We do not even own a washer and dryer now so there's no going back. Does that help anyone? I hope so. Do you have any questions? I would be happy to answer them to the best of my ability. I am no expert. I just know what works for us. 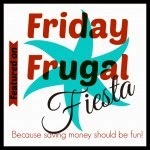 Be sure to check out the 35 of my Most Frugal Tips! Gosh, it has been a crazy few weeks. I won't go into all the details but our family has been on an emotional roller coaster. Satan has attacked us hard but God was always on our side and helped us conquer everything that was thrown our way. Today, our family took a much needed day off and it was perfect. We swam in our new pool. (The very first pool my hubby has ever owned). It's not a big pool but perfect size for us and we need no bigger. Then after swimming, we sat under our canopy and had a cookout of hamburgers and hot dogs. Gosh, food tastes so much better when it is grilled over charcoal! Anyway, the day was perfect. Things are going to slow down for us now (we think) and I should be back to writing daily. Thank you for your patience everyone!